Something that is particularly interesting about Eurostat is that it clearly highlights that Europe is not homogeneous. Some countries bare similarities especially those who are geographically close. But, overall each country has its trends, that is why a site like this which provides a comprehensive overview is critical. Eurostat provides a massive amount of data covering all sectors of society, thus making it helpful to anyone with an interest in investigating and comparing European countries. The data which Eurostat provides would be ideal for anyone planning to expand their business from one European country to another, policy makers trying to compare themselves to other countries, or one could even use it as a teaching resource. 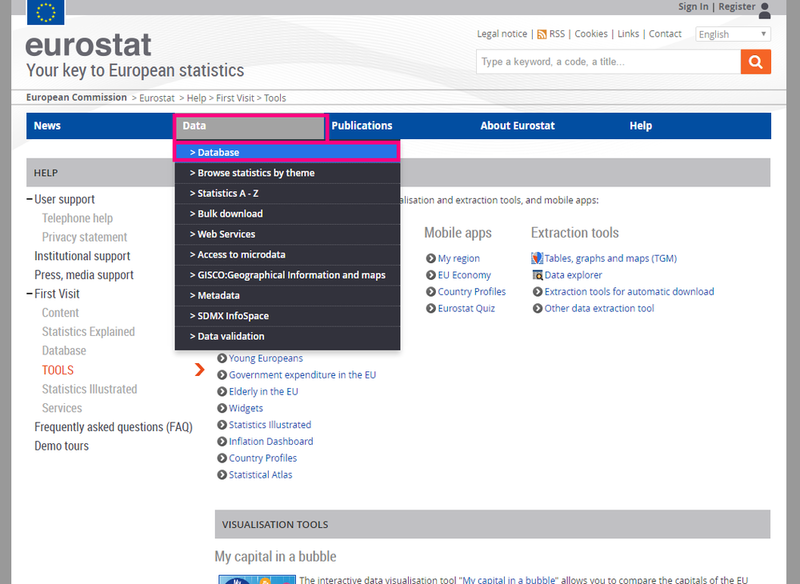 Eurostat offers, up to date news, data tables, visualisations, publications, and reports. There is so much raw data it can be overwhelming. Thankfully, Eurostat has provided user-friendly data visualisation tools. The Eurostat website has some excellent tools to see interesting and helpful data presented to you in a clean, clear, and concise format. This section will show you how to access and use these powerful tools. First things first, head to the ‘help’ section of the banner and select ‘First Visit’ from the down drop menu. From this page, select tools from the sidebar menu. This selection will take you to a page with a range of visualisation tools, which can be used to quickly gain an understanding of the data and make comparisons between regions. For example, if one selects “My capital in a bubble” we are provided with a comparative graph displaying how different capital cities perform on a number of verticals. You can change the sector and vertical by simply clicking the chart. Eurostat also offers handy data visualisation applications which are available on your mobile. To access these follow the same instructions as above, but scroll down the page and you will see the mobile apps. Apart from these very neat and practical data visualisation tools that will be sufficient for most user’s needs, Eurostat also provides open source data tables. To access these, select the data tab on the banner bar. This brings you to the database, a page with a categorised list of data tables. To view a table simply click either icon, the former will open the table in a new window referred to as “data explorer”, the latter will download a zipped TSV file.